My new favourite thing to do with my daughter is to bake biscuits & cookies. She loves it… it’s like Play Dough but she’s allowed to have a taste and enjoy the results. Predictably her favourite word is now ‘cookie’ but I don’t want her to eat too many sweet treats. The problem with most cookie recipes is that they contain a lot of refined sugar. This recipe is totally sugar-free as it is sweetened with dates so I don’t feel so bad if she eats a few. Not only are these treats naturally sweetened they are also wheat-free and contain no butter. I have used rolled oats & coconut oil instead. They are delicious and so easy to make. 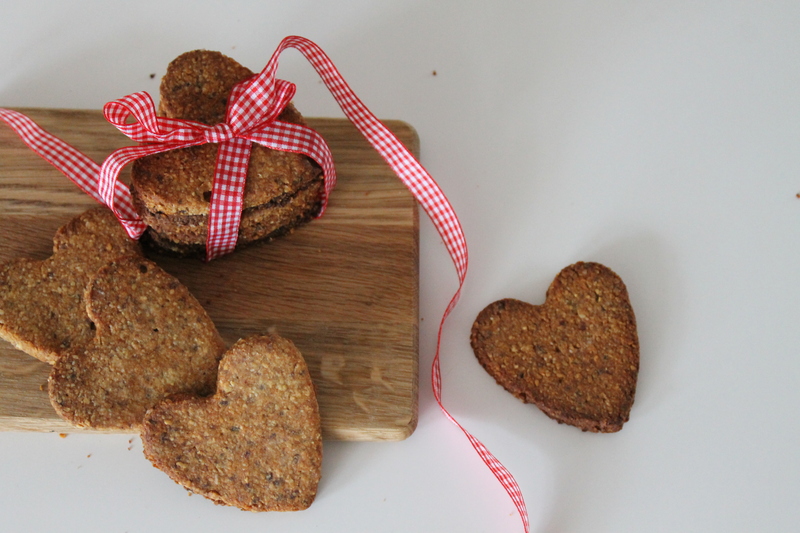 These heart shaped biscuits are the perfect thing to make with your little ones on Valentines day! Put all the dry ingredients (dates, coconut, oats, nuts, sesame seeds and orange zest) in a food processor and blend until you get a crumb like texture. Transfer to a mixing bowl and add the coconut oil & orange juice. Mix well. You should obtain a dough that holds it’s shape. Wrap in cling film & let it rest in the fridge for at least 15 minutes to firm up. Take out of the fridge and roll onto a floured surface (I used rice flour to keep this completely wheat-free) with a floured rolling pin. Roll to a thickness of approx 3mm, and cut using cookie cutters. Place on a baking sheet lined with parchment paper. Repeat the process until you’ve used as much of the dough as possible. Bake in the oven until lightly brown for approximately 20 minutes. Once out of the oven place on a wire rack to cool and firm up.